Often times you hear of home ownership referred to as the American dream, but this isn’t always the case. There are numerous factors to consider when deciding whether to buy your first home or to continue renting – especially when you’re out of college. Since living expenses consume a considerable portion of most people’s income, it is a good idea to put a lot of thought into the decision and where your money is ultimately going. 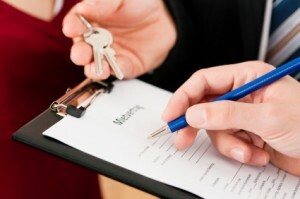 Here are a few factors to consider before possibly making the leap into home ownership. Generally speaking a credit score below a 620 will not be enough to qualify you in buying your first home. If you are below this number, it is best to spend the next year or so making a conscious effort to rebuild your score. While you may not want to delay the first purchase of your home, you have to realize that a low credit score, even if the bank does approve you, will not allow you to get the best interest rate. In fact, you’ll probably pay over 1% more than the lowest rate, which will cost you hundreds of thousands of dollars over the life of the loan. Although there has been a lot of positive news in the job market, it’s still not strong. Being laid off is usually not something you can anticipate unless your employer is extremely transparent. If you don’t have an emergency fund in order to make at least the approximate payment of your anticipated mortgage and expenses, you are not ready to make the leap into home ownership. Most lenders require that you have at least three months of reserves for all your expenses, if not more. Additionally, even if you have or plan to voluntarily leave your current employer, you may have a difficult time securing a mortgage. Lenders like to see a history of employment, if not with the same company, than at least in the same industry. Other factors to consider are how mobile you are. If you are at high risk for being relocated or do not intend to stay in the house for a considerable amount of time, you could very well lose money in the case of a sale. A general rule of thumb is that your property needs to appreciate at least 10% in order to avoid losing money in a sale. This is a big problem for recent graduates. You may have to move to secure a good job, so you don’t necessarily want to settle down and buy right away. You never know what could be in store in 2-5 years. A home is a continuous project that requires time and money to upkeep. It is always a good idea to have a home inspected before closing on it, but even then, not all of the problems and potential problems are evident. In addition to an emergency fund, it is recommended that you have a reserve fund of at least 5% of the purchase price of the home in order to cover maintenance and upkeep. Furthermore, not everyone wants or knows how to maintain a property. Many people prefer to rent in order to have the benefits of a house without the risk of ownership. Just think – when the pipe breaks, you just call your landlord and you don’t have to deal with (or pay for it) yourself. In some cities and states, it costs significantly more to buy vs. rent in both the short and long term. It is a good idea to not only consider all of the above factors but to also do extensive research on the area you are looking to buy and do a cost comparison between the two for at least five years out. Tax considerations are also important because of the deductions and depreciation savings that can come with owning your own home. Consulting a CPA may be a good idea if home ownership is on the horizon. There are obviously many factors that go in to deciding where you live. Although owning a home is something to be proud of, there is no fault in waiting to own until you are in a good place to do so. Don’t just jump in because interest rates are low or home prices are low. There are a lot of other, more personal, factors that come into play. Preparation and planning are two things that cannot be stressed enough when any major financial decision is made, and deciding on where you live is no exception. Guest Post Author Bio: This is a guest post by Robert Farrington from The College Investor. He writes about everything from how to pay off students loans to how to get started investing. Great article! In terms of market, now is a GREAT time to buy a home, but your personal situation must always come first. Yes, it doesn’t matter that interest rates are low if you can’t handle home ownership yourself. We wanted to buy our next house this year, but we have decided to wait until next year. We want to save up enough money! Another year isn’t going to hurt anything. Maybe you don’t get a 3% interest rate, but a 4% interest rate still isn’t bad! Depends on location in terms of external factors. Some areas are severely depressed in terms of housing market, while others are flourishing. We have an area in town that was the “Foreclosure Capital”…now, it’s the top housing market in town as everyone rushes in to buy. There’s also your lifestyle. Do you want to travel for long periods? Do yard work or stay out late? I had a friend who chose travel over buying a house and it worked out well for him. You also have to decide if doing yard work is your thing, or if not, can you afford to pay someone or move into an HOA that takes care of that stuff. Excellent points. Many people rush into buying a home. If your credit score is a little low then your downpayment is probably low as well. If you take one to two years to rebuild credit and save money for a stronger downpayment, you will not regret it. It’s especially important to have a solid fund for home maintenance if you are not buying a new home. Even with a new home you need some set aside for unexpected expenses. Yes – home maintenance funds are key! Being a homeowner has led to all types of random expenses I’d never thought of prior to being a homeowner. good points! We should really take into consideration a lot of factors before making that final decision to buy a home. Buying a home is a long term decision, it’s not like renting a place which you could give up on a shorter time frame, depending on your contract and the circumstance covering your stay at the place. The market might say yes it’s time, but how about from your end, are you really ready to take the plunge? The low interest rates on home loans are very appealing, but we don’t have the down payment saved up yet so we must wait another year or so. Hopefully housing prices don’t sky rocket! It is always good to save up what you need first vs borrowing more.